Austin Melcher submitted this photo and caption. 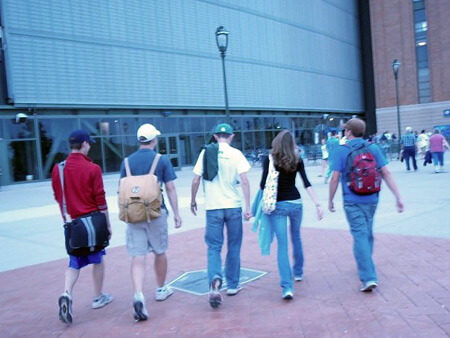 This photo of the 2008 Pioneer bass drum line was taken on our way into Miller Park in Milwaukee to see a Brewers game during our everyday rehearsals in June. It was a nice change of pace from our hectic practice schedule. We were tight with each other even though we all didn't come together as a full line until a week into the pre-season. We walked everywhere in order and always in step. From the left: Austin Melcher (Bass 5), Lukas Snyder (Bass 4), Jordan Roddel (Bass 3), Sarah Lasecki (Bass 2) and Brandon Cato (Bass 1).